Dubstep fans who enjoy having their faces melted by insane bass drops, you should know that Skrillex has a new full-length album coming. If you need yourself early access to the album, titled Recess, you can stream it via a new game for Android, Alien Ride. 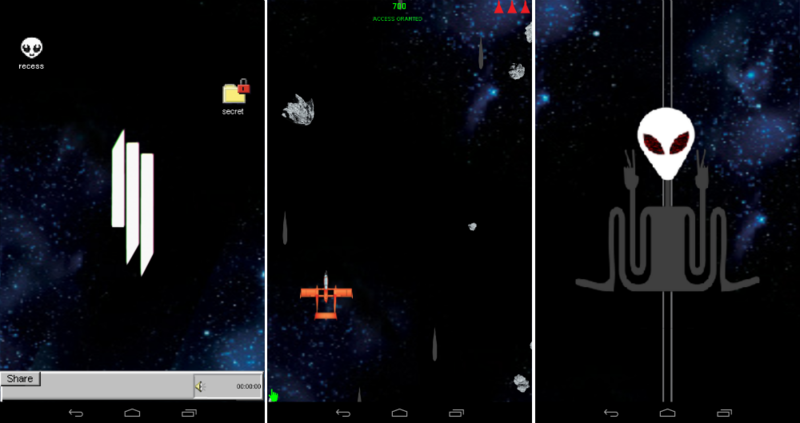 The game is pretty simple, and should remind you of an old school space shooter. Health packs and upgrades float down from the screen, and the better you do, the more features/songs you unlock. Once you do pretty good, you will see your score (lit in green) say “Access Granted.” Quickly tap on that, then you will be taken to a new screen where you can stream the tunes off of Recess. While this may sound sweet, user beware. After getting far through the game, and then seeing the “Access Granted” at the top of the screen, I get nothing but force closes. After seeing reviews on Google Play, it appears I’m not the only one who has had troubles actually streaming the album. But if you love Skrillex, then you can try for yourself.